Crews working to extinguish the smoldering remnants of a wildfire that scorched some 400 acres near Lake Jennings had the burn area fully contained as of late Thursday afternoon. Engine emissions from a passing vehicle sparked the blaze alongside Interstate 8 near Olde Highway 80 in the Flinn Springs area of eastern San Diego County shortly before 2 p.m. Tuesday, according to Cal Fire. Within an hour, authorities issued an evacuation order for residents of threatened homes along nearby View Side Lane. The blaze, dubbed the Jennings Fire, also prompted a temporary closure of Interstate 8 between Tavern and Lake Jennings Park roads, which led to hours of gridlock in both directions. 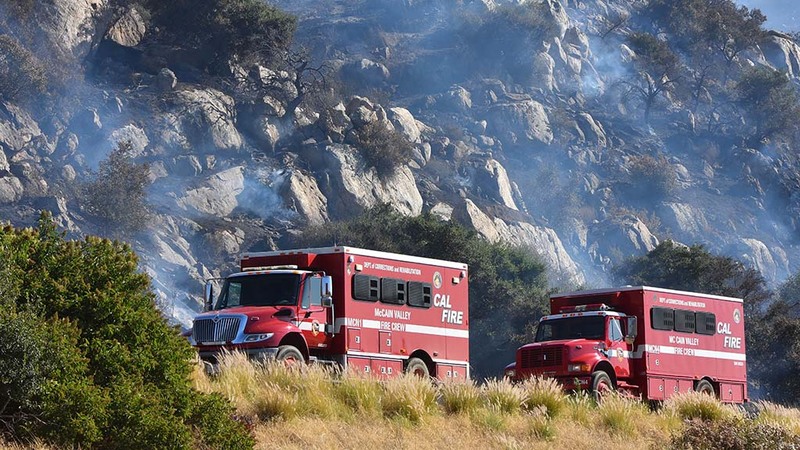 One to three eastbound lanes near the fire were out of commission at various times as firefighters continued to douse hot spots and create lines of control around the charred areas. The interstate was fully reopened as of 4:30 p.m. Wednesday, according to the California Highway Patrol. Late Thursday morning, several small vegetation blazes erupted near the northern edge of the largely contained burn zone of the Jennings Fire, forcing another closure of one lane of Interstate 8 along with the eastbound off-ramp to Tavern Road in Alpine until crews were able to subdue the flames.